No story!, just wanted to draw something kinda cute. Also Mekiko your such a hipster.... Can you guess who's music she has been listening to..I'm sure its not to hard to guess. She is a pretty little thing. I like the purple highlights in her hair, and I've always had a bit of a soft spot for characters with earth tones and more or less natural colors. The shades of brown you've used for her are quite lovely. I really like the serene feeling of this scene, too, and the little smile on her face like she's greeting a friend, or maybe just a friendly stranger. It's really sweet. The jacket looks good on her, too, and her little yin-yang necklace is cute. Beautifully done! Been wanting to get better with clothing, so this happened. 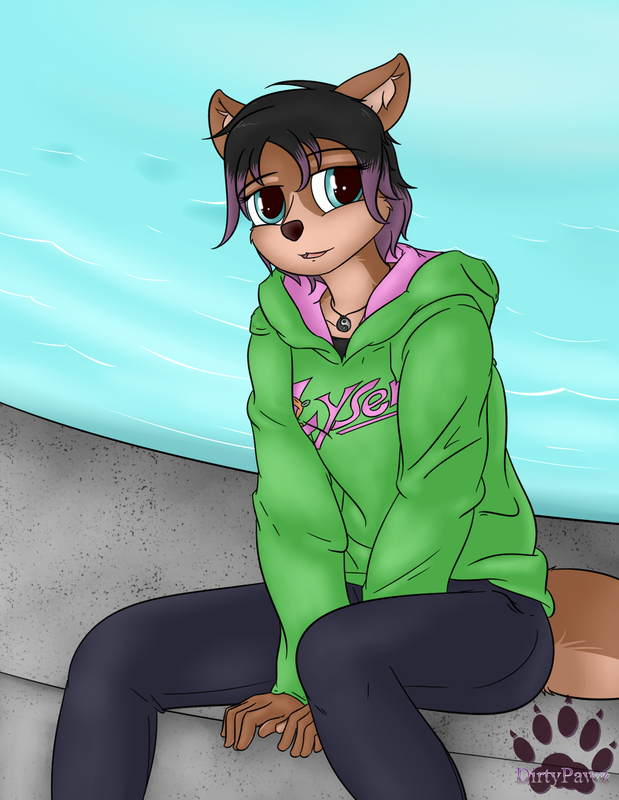 Also was going to write a small story to this... but to pooped to do so, was going to be from the readers point of view, so she could be waiting for/ smiling at anyone that was reading this. and damnit, just realized i left in black outlines... oh well. XD and damnit, just realized i left in black outlines... oh well. -shrugs- Wearing the name, of a music fur "you prolly havn't heard of"
Sometimes you've just gotta indulge in the cute, and Mekiko is always so adorable! I love the casual, cheerful mood of this picture and the feeling that, in spite of everything she's been through, she's still a pretty ordinary little girl. It's nice to see her smiling, and the outfit is really cute. I'm always just a lil jealous of the her highlights. Kinda wish I was her age again, sometimes, so I could try that myself. Though talking my parents into letting me get them woulda been a whole other thing. I would be there an hour early. No waiting on me for her! *gives mekiko a big wet hug* ... sorry, blame it on the rain. really love seeing her like this just relaxed and doing well.